The gobble gobble alerted us that there were turkeys in the garden this morning: one big guy ruffling his feathers and a lot of ladies acting coy. I know it is a jungle out there, and this turkey’s future as father of a clan is only as good as his last ruffle, but the task at hand looked simpler to me than our week here in the office. It made me a bit wistful for a technology free life because we had a doozy of a technology filled week. First thing Monday morning, we discover our Email server is down, and there is no email to be read. Since Monday morning unfolds based on picking up all our email orders, we retool our plans and organize different jobs. We’ll focus on phone messages and orders first! Sarah goes to pick up the phone messages and finds a recording that our phone messaging system has been cancelled by our phone company so a new and improved system can be implemented. We can neither pick up our messages nor have anyone leave a message until we set up our settings on the new system. Only problem? The pin number they said they sent us in the mail has not arrived. I call the phone company. Forty five minutes of menu options chosen and me forwarded from one department to another and finally I get Matt in repairs. He tells me to try typing in four 1’s into the phone as a fake pin. This sounds like a dubious solution and necessitates me hanging up on Matt to find out if it will work. I ask him how I get back to him if this doesn’t work. He says it’s not possible. We bid each other a fond farewell, and I try the four 1’s. Miraculously, I am able to access the system and make a new message for you all, but the new improved system does not give us the option to back up and re-listen to a small part of any of your messages. If we miss a phrase, we now have to listen to the whole message again. This strikes us as new but not improved. By now, it is clear that actually getting accurate information for orders is not going to be enough….. because all three printers are refusing to print. One is telling us the paper size is not correct, and it won’t print out any invoices. After about two hours of fiddling, we discover that the ream of paper does, in fact, have wrong sized pieces in it and the solution is to get a new ream of paper. Meanwhile printer #2 is telling us a piece of paper is lodged in the system and needs to be removed. Despite our best efforts, this piece is not found ’til about 9 pm when Will finds it in about a nano second. Printer #3 balks for unknown reasons. We need to turn off our systems over and over again to get printer #3 to connect to the network and print. Not to worry! We’ll focus on Facebook for the moment….only Facebook has taken us to its new Timeline format, and we now need to change our background photos and information for an immediate reboot. The Green Hope Farm logos is distorted in the new format and we have to fool around with our Jpeg of the logos to get it to fit. This is beyond me, so I leave Emily to solve this challenge, and I go out to the gardens to take a photo for the background photo of something blooming out of season (as everything does these days). Yup, just as in your world, the weather here is as confused as our technology. Flowers that usually bloom a month from now are in full flower. Lizzy is getting married in the gardens in about a month. As I wander the gardens, I try not to think about the fact I have no idea what will be in blossom in a month. No idea. Was it wise to pick a wedding color scheme based on May Flowers when all the May Flowers are blooming now in April? I wipe these questions from my mind and push on with the task of getting the needed Facebook photo. I get in position for a shot of Flower Quince and the “Change the Batteries” message fills the screen. Back in the office, I see the pile of mail. Mail! It’s so 19th century! I will focus on the mail and leave the malfunctioning printers, Facebook problems, dead camera, phone message challenges and email void to the flexible fun loving twenty somethings on staff. I will open the mail and imagine I am living in a time when going to the mail with our packages isn’t like a background security check to join the CIA (what our dear postmistress must now do with our packages is another story for another day). More thoughts pushed aside, I settle in to ENJOY the mail. A box from Amazon is on top of the mail pile. Happy days! If you have gotten a package from us, you know we decorate our boxes with Flower pictures. 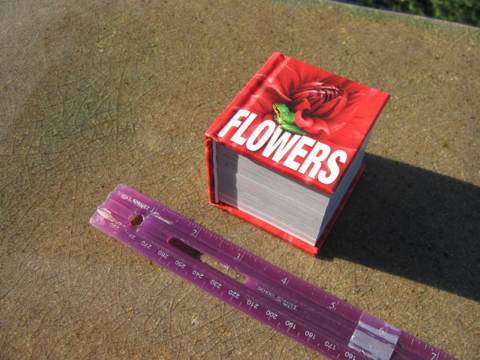 This means we go through a lot of Flower photos, so I am always seeking out remaindered Flower books from Amazon to cut up, the kind of book that cost 23 cents plus shipping. Recently, I stumbled on a new remaindered book appropriately called Flowers. The first of several copies ordered lay before me! I open the box with bated breath! Oh dear! There is no technological gizmo to blame for this snafu! Its 100% me!!! I didn’t notice the SIZE of this book- just the number of pages- 700 pages of Flower photos for 54 cents and shipping seemed like a windfall. 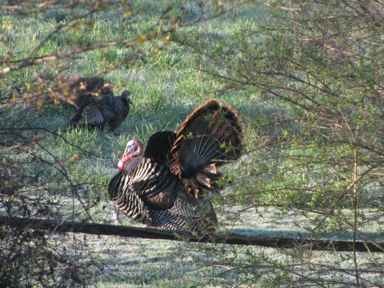 I think it is time to head out to the gardens and track down those turkeys. I clearly would make a better turkey than a 21st century woman! 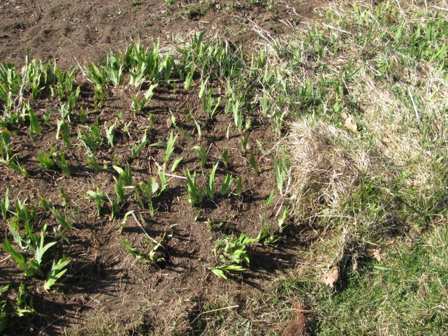 Unlike so much of life, as I weed my way through the garden beds, it is easy to tell where I am in the process. 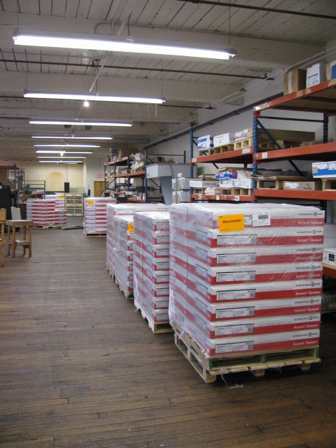 A Heck of a Lot of Paper! The final draft of the next “Guide to Green Hope Farm Flower Essences” is now in the hands of the printer who showed me the recycled paper ready and waiting! This is a magic time in the gardens. Only my cut up hands and creaking knees would disagree. Soil amendments and manure have been put on all the garden beds. My back particularly remembers the spreading of 400# of lime. Old foliage from last season has been cut away. How is it that I always think I have done this job well in the fall, and then in the spring, it looks like I didn’t even do any cleaning up at all? The lawn has turned that luscious spring green and Jim is counting his final hours of freedom before he and his lawnmower become inseparable. The last of the pruning is behind me and it was a particular joy to finish the Pear tree that seventeen year old William started to prune in February but then “didn’t have time to finish” in the last eight weeks- What can I say…. March Madness NCAA basketball IS time consuming. I am still in one piece except maybe for my face where a plum branch took a divet out of my cheek yesterday. 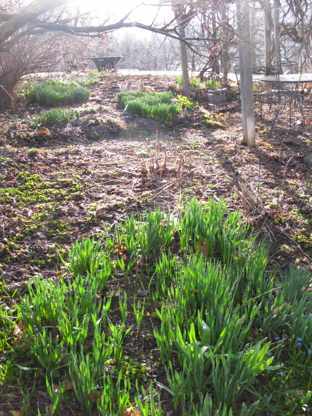 Fresh green leaves rise up, each one a returning Flower friend that I am glad to see except for the crab grass. It’s a moment of promise. Except maybe not from William. There is the fantasy sense that even if plants haven’t peeked out of the ground with new green growth yet, they are still alive. I can look out on all the gardens and believe that I remembered to correct all the flaws in their designs I noticed last season even though I didn’t look at my copious notes once or actually change anything. Ahhhhh Spring….. when hope springs eternal and I crawl happily into the house at the end of each day, finally understanding why they sell those stupid stands for gardeners to kneel on.